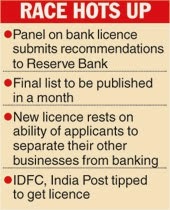 IDFC and India Post are believed to be in the final lap of the race for a banking licence. The Bimal Jalan panel, which is scrutinising the applications, submitted its recommendations to the Reserve Bank of India here today on around 25 applications that included L&T Finance, Religare, Reliance Capital, Shriram Capital, AV Birla Group, LIC Housing Finance Ltd and Muthoot. Top officials said IDFC was likely to be among those selected for the coveted licence. India Post could also get a licence if the cabinet agreed to allow it to convert itself into a retail bank with a large rural network. These applicants were also not asked to come up with explanations or additional documents to prove their eligibility, the officials added. The finance ministry, which is opposing India Post’s conversion into a bank, has not earmarked any funds for it in the budget. However, several other ministries, including the telecom ministry, maintain that it is the best way to fully utilise the huge postal network, which has long been doubling as a small savings bank and pay order service. Analysts also believe that India Post, with its huge rural network, will be helpful in rolling out the government’s Aadhar-linked subsidy payout schemes. Initially, IDFC was considered ineligible for the licence as the RBI demanded that banks should have less than 50 per cent foreign holding.The development financier had foreign ownership of nearly 54 per cent. However, last December, IDFC gave an undertaking to reduce foreign institutional shareholding through a listing on the Bombay Stock Exchange. “The board of directors on December 19, 2013 passed a resolution approving postal ballot process for seeking an enabling resolution from the shareholders to authorise the board to keep reducing ceiling limit of the foreign shareholding from existing 54 per cent to 49.9 per cent in various stages as and when the actual foreign shareholding goes down,” it stated. Officials said the grant of a licence was not tied to the announcement of the Lok Sabha election and could be given out even if the code of conduct kicked in. The RBI is expected to draw up a list of successful applicants and announce it by March-end. The RBI will look into the background of each company that has been shortlisted by the Jalan panel. The government had been locked in a tussle with the apex bank over eligibility criteria for the licence. The Reserve Bank wanted to keep out large corporate houses and real estate bigwigs as their business interests might clash with the prudential norms needed to run banks. The finance ministry was keen on the participation of corporate houses but favoured rules that would set up a wall between the owners and the banking operations. Officials said the bid to prevent the business interests of companies from clashing with the banking operations would act as a determining factor in the grant of a licence.